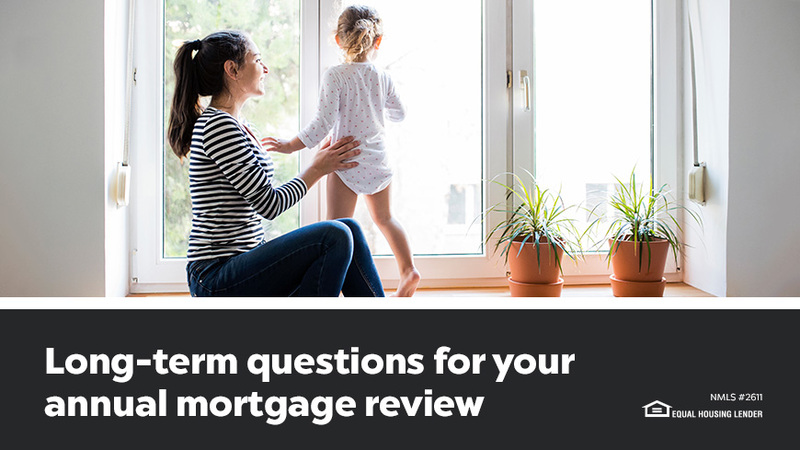 Whether you’re looking to pick up the pace on paying off your home or you’re looking for a more stable option, it’s the perfect time of year for your annual mortgage review. Depending on when you purchased your home, mortgage rates have likely changed. And chances are you’ve had some impactful changes in your life since you closed on your home. What may have been particularly attractive to you as a first-time home buyer, might not be your best option anymore. Here we’ll offer some loan alternatives to consider. If you have a Federal Housing Administration (FHA) loan… You may want to consider refinancing to a conventional loan. Perhaps, like many first-time homebuyers, you opted for an FHA loan when you purchased your home. You were thrilled to hear you didn’t need to put down the old industry standard 20% and an impeccable credit score wasn’t the end-all-be-all. You didn’t mind absorbing the required mortgage insurance into your monthly payment if it meant you could actually own a home and begin building equity. Has the value of your home increased since you originally purchased? As the value of your home increases, so does your equity. You could use this increase in home value as leverage to successfully refinance and potentially lower your monthly mortgage payments. If you’ve built up an 80% loan-to-value (LTV), switching to a conventional loan could provide the opportunity to eliminate your mortgage insurance. Mortgage insurance alone can range anywhere from $100 - $500 per month. Just think of what you could put that money toward—renovations you’ve been putting off, college tuition, retirement funds—the list is endless. If you currently have an Adjusted Rate Mortgage (ARM)… You might want to consider refinancing to a fixed rate. When you originally purchased your home, you opted for a little uncertainty in turn for a lower rate. Whether you knew you’d be moving before your ARM adjusted, you were testing the waters of homeownership or you wanted the lowest possible rate for the time being, an ARM was a great option for you at the time. If you’ve had significant life changes since then, you might be looking for something with more consistency. When is your ARM set to adjust and do you know what the new rate will be? Before you sit back and let your ARM adjust, you’ll definitely want to investigate what your adjustment will look like and what other options are available to you. Since you originally purchased your home have you gotten married or maybe welcomed a new baby? Are you planning to have a child or another child in your future? Now that you have a family to consider, maybe you want a mortgage that’s less risky. You have enough to think about: you forgot to buy diapers, the laundry hamper is over-flowing with onesies and you haven’t booked flights for Thanksgiving at your in-laws. The tickets are getting more expensive by the day. With all this fluctuation in your life, you might be looking for some stability. Are you planning on staying in your current residence for more than 5 years? ARMs can be a great option if you know you’ll be moving or refinancing within the timeframe of your current rate, but if you’re planning on keeping your current home as your forever home, you might want to explore a fixed rate. Are you currently paying on a jumbo loan? An ARM can be a desirable option when you’re first signing on a jumbo loan, as a means to keep your monthly payment manageable. But it’s also a risky move as more money is at stake. Before it’s time for your rate to adjust, make sure you’ll be able to afford the new adjusted rate. If you answered yes to some of these questions, you may want to consider your options and make sure you’re still benefiting from your current mortgage. To get started, discuss your financial goals, assess your home’s current value and speak with a licensed loan officer.